Yum! 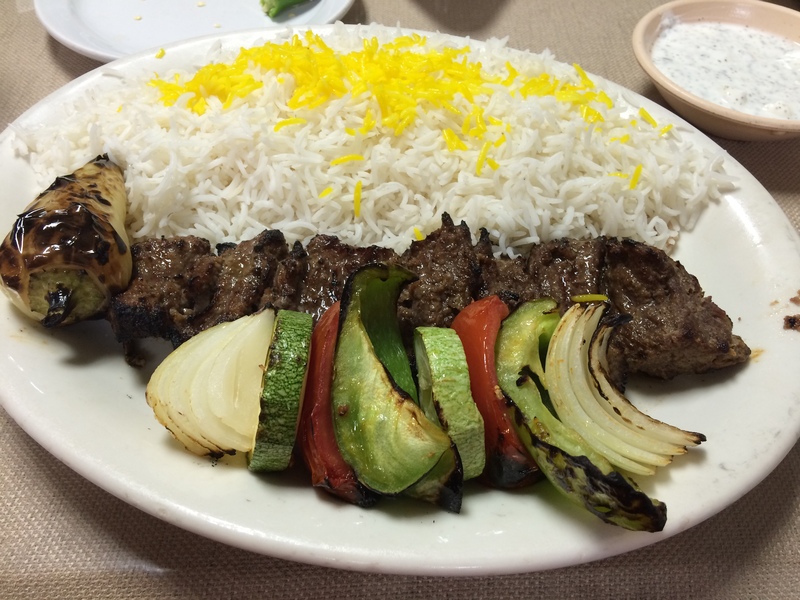 I ordered this classic beef kabob dish last weekend from Darban on 5th & Cedar. I normally consider this an excessive amount of meat for one person, but I was really hungry from all my riding that day. I was pretty full after eating it, but later on that night, I ate half a plate of chicken kabob leftovers. Occasionally, I feel like eating some meat. Ideally, I’d probably prefer this plate with about twice the vegetables, and half the meat. But then I’d want to eat two plates of it. Which is what I did anyways, when you count the midnight snack and the next morning’s breakfast. Lately, I’ve been slightly worried about getting enough protein. As I lose weight, I still want to build my leg muscles for cycling. I probably need to eat at least (80 kg)(1.2 g protein/kg/day) = 96 g/day of protein. As my diet is about only about 12.5% protein by calories, I’d need to eat (100 g/day)(4 cal/g)/(12.5%) = 3200 calories per day. I’m probably doing that, especially on hard training days, so I’m probably fine. But who knows, maybe I could optimize my weightloss and cycling training with a slightly higher proportion of dietary protein. The best solution would probably be a protein shake for recovery, with no other dietary changes. Eating a little bit of meat for taste and variety is great, but you don’t need this amount of meat for a meal.